25 years in the making, Halloween Horror Nights 25 is right around the corner. I’ve been attending HHN since 2002, Halloween Horror Nights 12 with the Caretaker (for the non history people). 13 years later here we are at the 25th anniversary of HHN. To the die-hard community this is a year that we expect and want Universal Studios to go all out and give us everything they got. Most of us that have been going for the past 10+ years remeber a time of no IP’s and all original content, from the minds of Universal Creative. We remember the generic, more low budget? and just plain blood and gore of the house content. 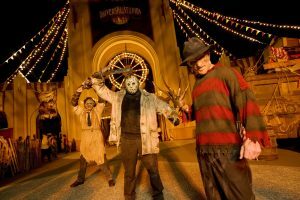 We remember the ICONs, Jack the Clown, The Caretaker, The Director, The Story Teller (and Terra Queen), Bloody Mary and FEAR… Halloween Horror Nights 18 (2008) seemed like the last truly great all-around year for Halloween Horror Nights! Can we return some of the memories from year’s past? Let’s take a look. At the end of last year we were teased with pictures and a video that showed Jack the Clown returning. Was this the right choice? Should they have went with a new ICON? I believe Universal made the right choice here. Jack, after all was the first true Universal created ICON for Halloween Horror Nights. 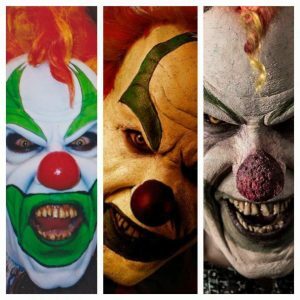 He’s hosted HHN in 2000, 2001 (with the removal of Eddie due to the events of 9/11), 2006 (along with Caretaker, Director and Story Teller for Sweet 16), 2007 and was part of 2010 with FEAR. He is known to the die-hard community and to the general public! His official return was announced this past week with a couple promo videos. Jack has aged over the years, and has a very different look for Halloween Horror Nights 2015. We also got the launch of the HHN 25 website (a early version) announcing 9 Houses, 5 Scarezones, 2 Shows and 30 nights to scare you! This will be the first year for 9 houses, up from 8 that has been the norm for the past 8 years (the last time Jack hosted the event in 2007). Did they say that right? 9 houses? Where could they possibly put a 9th house? We know from years pasts locations that previously held houses have been removed for new attractions and stores within the park. Limited soundstage options due to various productions and TNA wrestling. Would they put up a 3rd Sprung Tent? Maybe build another warehouse? Early rumors had this house going in the Men In Black extended queue, although could of worked that area of the park is a nightmare all in it’s own with the entrance and exit of the Sprung tent houses, MIB and Bill & Ted. Things changed, where could they go now? In the past there was strange talks of putting a house in one of the Shrek 4-D theaters, yes there are 2 of them.. one in the front and one in the back of the soundstage. The 2nd one (rear) is rarely used. Now you ask how can they put a house in a theater with seats and a screen? Simple, gut the back half of the building removing the 2nd theater entirely. The Shrek 4-D soundtage is roughly the size of soundstage 24 which can hold 2 houses, so removing one theater in the Shrek 4-D soundstage can work and already has it’s own queue line. Keeping with the houses, what are we looking at? Back to the die-hards. Original content! Will we get it or will we see what some call the “Hollywood” affect? As of this writing it looks like the rumors have Universal going with a mix to please both the die-hard community and the general public. 5 IP’s and 4 OC’s. Let’s take a look at the list of what is RUMORED (nothing official). I will start with the IP’s. Again? Really? Do we need another TWD house? 4 years in a row? The longest/biggest house ever in the history of HHN in 2014. The show brings in big numbers for AMC, the house brings in big numbers for Halloween Horror Nights. Yes, here we go again! The general public eats this up like candy, from the advertisements to the merchandise. It will bring the GP in to the event. The die-hards? No, not again! Don’t get me wrong I love the show but to me Universal hasn’t done the show justice in the 3 previous attempts. To me it’s just another zombie house with a lot of moaning and groaning. No characters, which it lacks and I believe would help the overall experience.. but money would have to change hands here! Give me another Deadtropoils house, or Dead Exposure over TWD (IMO). Should of been done a long time ago, when it was relevant! Will it work? Sure, the movies have a pretty good following and were pretty good overall. I think this house could be good, I haven’t seen the 2nd movie and the 3rd will be coming out. It will bring in the masses due to that. This could be the 2nd IP house that I like the most for 2015. Jack brought these two, along with Leatherface to HHN 17 in 2007 for the Carnival of Carnage, so it fits with his return and 2nd Carnival theme maybe? for the 25th. Back in 2007 none of these characters could be seen together at the same time due to any confusion that could of came out about a Freddy vs. Jason vs. Leatherface movie, and other things as well. They were only seen together in promo photos. This should be the IP I enjoy the most due to me loving this type of horror genre and the characters as well. Loved the houses in 2007. Another again? So soon? Why? What could they possibly do to this? Did the puppets cost that much that Universal wants to use them again? The first house IMO was great, I loved the movie and thought Universal did great with the house from the puppets to the scenes and overall feel and look. But, now what? Other than new scenes (some from the Hollywood version), not sure where this will go. That’s the 5 IP houses. My early ranking just based on titles and what I’m looking forward to have my IP list like this. On to the original content houses. To us old-timers and die-hards, this is what we long for. The minds of the creative team. The general public will still be waiting in line for The Walking Dead! We have 4 OC houses to look forward to. 3D houses in the past tend to be the “fun” or “comedy” type houses of the event. Not sure if this will follow the movie, or be more like the Asylum in Wonderland scarezone at Halloween Horror Nights 18 in 2008. If it’s like Asylum, on a bigger/house scale this could be a good house. I didn’t get to experience the first house, but got to experience the 2nd but not that great RUN: Hostile Territory. If this features Eddie in all his glory and based off the 1st version of RUN, I’m all for it. Let’s RUN! The first one at Halloween Horror Nights 20 in 2010 was a museum type house, showing the vast collection of props and items used from previous events. This version could add things from the 2010-2014 along with housing some of the ICONs like in the first one each cast would have different ICONs and/or supporting characters. Great photo-op house for the VIP tours as well which is extra money in the bank! COLD BLIND TERROR 2!!!!! This is going to be so so great! Wait? I couldn’t see half that house, what was that again? This will be even colder and more dark and more blinding lights than EVER before! You’ll come out needing to hit the bathroom for sure, and I’m not talking about due to all the over-abuse of drinking! Ok, in all seriousness this is supposed to be a mash-up of Body Collectors and Pyschoscarepy. Not sure how these two worlds come together and don’t think they will. Thinking half Body Collectors and half Psyschoscarpey. Which versions? Now, the original Body Collectors at Halloween Horror Nights 15 in 2005 was one of my all time favorites, from the pure blood and gore that this house offered and haven’t really seen anything like it since. The original Psychoscarepy at Halloween Horror Nights 13 in 2003 was also a classic and one of my favorites. Go this way, and anyone that didn’t get a chance to experience them is in for pure greatness! Did I say I love OC houses? My rankings here is tough, but based on what we have. We’ll have 5 Scarezones this year, as with the houses we have an early rumored list. Everyone loves the elaborate/big propped zones. Not that roll-out/temporary stuff that has become what we see now due to the daytime parade route. Let’s take a look at what is rumored. This looks like it could be home to another photo-op zone that follows the path of 7 and Face Off or a type we saw at Sweet 16 i 2006. It’ll more than likely contain your ICON’s and other characters from years past, with a mix of we saw in 20 Years of Fear in 2010. Great for history! The traditional look of Halloween. Trick or Treaters, Pumpkins, the classic things. Throw in the Skoolhouse for a throwback? We’ll see! Escape of the Psychoscarepy inmates? A lead in to the house entrance perhaps? Loud heavy metal music more than likely! Street of the year? Probably! All Nite Die-In/Horrorwood 2? A large drive-in style screen like at Halloween Horror Nights 19 in 2009. Rumor has it one cast will show color movies, and one cast will have black & white movies. Not sure where they could put the screen here, unless it’s at the exit of the house/entrance to Disaster and you walk through it coming out of the house? Scary Tales? I loved the Scary Tales houses, and Fractured Tales at Halloween Horror Nights 18 in 2008. Could be a nice tie-in if Alice in 3D is in Shrek 4-D, but It seems that would go to a Sprung Tent if it follows years past for 3D houses. We also have a rumor of 2 roaming hordes, a male cast and a female cast. Could this be the CDT (Chainsaw Drill Team)? On to the Shows! 2 of them! We know that one is a given. What will be the other one? Not much to say here, you know what it is. The show has been hit and miss for me. 2006 was the last great year for me, but the past couple years have recovered well. Hope the show stays on that path. Rumor has the return of the stage show that all us die-hards have been begging for since the last stage show at Halloween Horror Nights 17 in 2007, also featuring Jack. Give us a re-boot of the Carnival of Carnage, that will be exciting or an all new show. Just make sure we have Chance back please! Should be enjoyable! To sum everything up, and what I think over-all! I’m not happy about all the IP’s, I would of liked either Scream or AWIL to be removed for another original house. HHN was built on original content, it should of been 5 OC’s and 4 IP’s. A good mix, but The Walking Dead.. again? Why why why? It’s all about the money here folks! The scarezones seem to have a good balance, but I hope this is the last of the “photo-op” type zone in Hollywood as I miss the bug elaborate set that used to be in this area and always was great just to sit down on a bench and watch! Some people complain about people complaining or being negative about the event. We are supposed to love this event, Universal can’t do no wrong. We haven’t seen it yet, it goes on and on! For every positive there as to be a negative, should we always sit here and say this event is great and we love it no matter what Universal does? NO! We need to be critical and talk about the negatives, this is what makes things better! You also hear, if you don’t like it don’t go, but your gonna go anyways so why complain? Why? Because there are more than just the houses, or the scarezones. We have shows, we have friends that we see, it’s more than just the event to some.. it’s to be social, and enjoy other things that can be positive. If you enjoy 100% of the event each and every year, your lieing to yourself! Time will tell if any of this comes true when official announcements come out! For now, let us know your thoughts either in the comments below on on the forums!